Additives to proteins that increase the stability of the folded state of the protein also tend to decrease their solubilities. These additives are excluded from the preferential water hydration sphere around the protein (negative binding of these agents). Denaturants in contrast tend to increase protein solubility and interact preferentially with the protein surface. In their presence, proteins respond by increasing their surface area by denaturation. For stabilizers, proteins try to minimize their surface area by staying "native" and aggregating to form a precipitate, both of which minimizes the surface area from which the stabilizing agent is excluded. molecular dynamics simulations: which gives insight into short but not long range interactions between ions and water. Recent studies have provided conflicting support for the notion of structure makers/breakers. Omta et al. 2003 have used femtosecond mid-infrared pump-probe spectroscopy to study actual H-bonds between water molecules in salt solutions (Mg(ClO4)2, NaClO4, and Na2SO4). In pump-probe spectroscopy, a sample is excited with a short pulse (pump) and after a short time lag, with another pulse (probe), which interacts with the excited state. The linear-polarized infrared pulses (pump) were used to excite OH groups in solution, followed by a probe pulse which was polarized 45 degrees compared to the pump pulse. Only those excited OH groups that had rotated in the time interval between the pump and probe would be excited by the probe. Using this technique, the time frame for reorientation of the OH groups, which is related to the "stiffness" of the H bonds, can be determined. The salts had no effect on the rotational motion of bulk water outside of the the first hydration shell, which suggests that salts have no effects on the H bond networks in bulk water. Mg2+ ions are considered structure making, as the ions greatly increases the viscosity of water, brought about supposedly by increased H bonds among water molecules. This study does not support this model. Increased viscosity of Mg solutions must be attributed to those ions directly interacting with water molecules. The solution can be modeled as bulk water with small rigid spheres of ion + first hydration sphere. Clearly, much more experimental and theoretical work must be performed to gain structure insight into the role of salts on water structure. Until then, we will continue to try to understand the effects of different salt on water structure in descriptive term and with use of thermodynamic quantities. Studies have shown that urea binds preferentially to the protein surface, and hence tends to increase the protein's surface area and hydrophobic exposure, and denature proteins. However, note in the figure below, that glycerol, a bigger polar but uncharged molecule, stabilizes the native state. This pair of uncharged additives have correspondingly similar effects on protein stability as do the charged guanidine HCl/ammonium sulfate pair. Figure: How reagents might interact with the surface of the protein. A graphical understanding of the type of sufrace changes that result from protein denaturation is given below. We will be discussing equilibria and how they may be shifted throughout this text. What accounts for this preferential binding or exclusion from the hydration sphere of a protein by these charged and uncharged additives? How do they affect DG0 and Keq for the processes shown above? Since denaturation is associated with increased protein size and alterations in the nature of solvent-accessible groups, it would follow that changes in the propensity for a solute (like urea or guanidine HCl) to partition into the hydration sphere (local water near the surface) of a protein compared to bulk water would change the DG0 or Keq for protein unfolding. A thermodynamic value, KP = mlocal/mbulk, can be used to quantitate the propensity for a solute to partition into these two phases, where m is the molal concentration of partitioning solute in the hydration sphere (local) or bulk solvent. A KP = 1 suggests no preference of solute. If KP < 1, the solute is preferentially excluded from the hydration sphere (resulting in native protein stabilization and aggregation), and if KP > 1, it is preferentially included, leading to denaturation. Since KP is an equilibrium partition coefficient, it is independent of solute concentration. Courtenay, Capp, and Record (2001) used vapor phase osmometry to determine solution osmolality (Osm) and in turn preferential interaction coefficients (DGm3), from which KP values could be determined, using the formulas below, where a3 is the activity of component 3 - solute - in solution. (1 is solvent, 2 is protein, 3 is solute.) For example m1 = molality of bulk water = 55.5 mol/kg and b1 is the biopolymer hydration per square angstrom.. Using BSA as a protein solute, they tested three destabilizers of native proteins: urea, guanidinium HCl, and guanidinium thiocyanate. Graphs of osmolaity vs destabilizer concentration (m3) showed almost linear increases in both the presence and absence of BSA, but with lines that crossed for the guanidium salts (lower osmolality in presence of BSA), which indicated strong protein:solute interaction. Hence DOsm=Osm(+BSA)-Osm(-BSA) < 0. For protein stabilizers, such as glycerol, glycine, and betanine, DOsm > 0, indicating preferential exclusion of the solute from the protein hydration sphere. Next, they determined, using vapor phase osmometry, the preferential interaction coefficients (from which KP values could be calculated) for BSA in the presence of increasing molal concentration (m3) of destabilizers. The values were always positive and increased with m3. KP values for the native protein were calculated to be 1.00 for KCl (control), 1.10 for urea, 1.30 for GuHCl, and 2.0 for GuSCN. For urea, previous calculations by the group showed the KP for urea and denatured proteins was the same as for native protein (1.10). Since it preferentially prefers to partition into the hydration sphere, and there is more hydration sphere in the larger denatured protein, urea drives protein unfolding. Using the guanidinium pair, they could resolve the KP values into that for the cation (GuH+) and the anion. For BSA, KP for GuH+ = 1.60 and 2.4 for thiocyanate. Similar calculations could be made of KP for the denatured state of BSA. The values for GuHCl and GuH+ were 1.16 (compared to 1.30 for the native protein) and 1.32 (compared to 1.60 for the native protein). Urea appears to partition selectively into the region near the peptide backbone and not charged or nonpolar surfaces. Theoretical and experimental work show that they are a constant percentage (13%) of the surface of a protein, whether in the native or denatured state, is composed of the peptide backbone. This make intuitive sense since the backbone extends over the entire length of the protein. 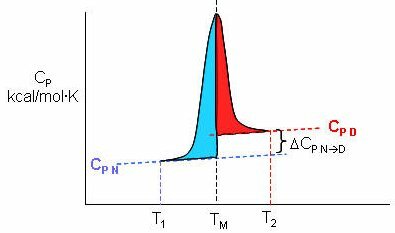 However, the % of the surface with charged side chains decreases in the denatured state since then number of charged and polar side chains are a small fraction of the entire polypeptide backbone. The lower distribution of GuHCl and GuH+ into the hydration shell of denatured BSA can be accounted for by different distributions of surface polar and charged groups in the native and denatured state as shown in the figure below. For example, the percentage of charged groups on the surface of native vs denatured BSA is 29% vs 4%. It appears that GuHCl partitions into the hydration sphere near the peptide backbone and charged side chains. Urea appears to partition selectively into the region near the peptide backbone and not charged or nonpolar surfaces. This work gives a possible theoretical underpinning to the qualitative effects summarized in the Hofmeister series. The graph above shows a maximum in benzene insolubility. As the temperature is decreased from that maximum, benzene becomes more soluble in water. Alternatively, as temperature rises to that temperature of maximal insolubility, the solubility of benzene decreases (just like nonpolar gases become increasingly insoluble with increasing temperature). If you extrapolate the DG curve in this range of decreasing temperature past the range shown on the graph, it would cross the X axis and become <0, implying benzene would be favored to dissolve in water. Does the low temperature behavior of benzene/water interactions (becoming more soluble as the temperature is decreased from the maximum temperature for its insolubility) extend to and predict protein behavior at low temperature? (The following figures shows the analogy between benzene solubility in water and protein denaturation. In the figure, F stands for a Phe side chains, which can be buried, sequestered from water as it would be in the native state of the protein, and exposed to water, as it might be in the denatured state.) The answer is yes, at low temperature. The analogy to benzene being more soluble at low temperature is the hydrophobic side chains in a protein becoming more likely to flip into water, denaturing the protein. The low temperature behavior would predict low temperature protein denaturation. This phenomena has been observed. Note that it doesn't require a change to a state when the nonpolar side chains prefer to be in water. Just a change in that direction might be enough to tip the balance and lead to denaturation of the marginally stable protein. Please note that we are attempting to extrapolate the thermodynamic parameters associated with benzene solubility in water to the denaturation of a protein, NOT TO THE SOLUBILITY OF A PROTEIN IN WATER! What about high temperature? Proteins denature as the temperature increases to the range that the DG curve for benzene reaches a peak. If the hydrophobic residues behave like benzene they would like to stay buried and not flip out into water as the temperature rises to the maximum in the DG curve. Hence this predicts that the protein should become more stable. What then explains the denaturation of proteins at high temperature? Another factor must account for it. What is it? Remember the trans to gauche conformational changes in fatty acid residues in liposomes? As the temperature is increased, more conformations become available and occupied. Consider a protein. At low temperature, their is only one native state and to pick a number, maybe 100 accessible denatured states. At high temperature, there is still only one native state, but possibly 1000 accessible denatured states. More accurately, think of the protein existing in an ensemble of conformations. As the temperature increases, more denatured states can be populated, compared to at lower temperatures, leading to an entropic driving force favoring unfolding. Which way would the chain conformational entropy drive the protein at high temperature? Clearly, it would be driven to the most number of states - to the denatured state. Hence a modern definition of the hydrophobic effect can explain low temperature denaturation, but not high temperature denaturation. Remember when we discussed the thermodynamics of transfer of aliphatic alcohols from water to the pure alcohol? We decided that DGo was < 0 (favorable), and that DHo > 0 (disfavorable) and DSo > 0 (favorable). Also remember that these figures were derived at one temperature. We were somewhat surprised that DHo > 0 since this implies that from an enthalpic point of view, the alcohol-water interactions, or the water-water interactions surrounding the hydrocarbon chain are more favorable than the alcohol-alcohol interactions or bulk water-water interactions. The freeing of structured water surrounding the aliphatic chain when the alcohol is transferred to the pure alcohol is the driving force for the reaction. What happens at different temperatures? I hope it makes intuitive sense that the entropy effects will change with temperature, as described above. Likewise it makes sense that the enthalpy would change. Hence DH and DS for the transfer of amphiphiles into water will be a function of temperature - i.e. the reaction proceeds with a DCp. It is clear that proteins are not all that stable, and many contributions of varying magnitudes must sum to give the proteins marginal stability under physiological conditions. Hydrophobic interaction, defined in the new sense, must play a major role in stability. Also, since proteins are so highly packed compared to a lose denatured state, London Forces must also play a significant part. (Remember dispersion forces are short range and become most significant under conditions of closest packing.) Opposing folding is the chain conformational entropy just described. Since proteins are so marginally stable, even one unpaired buried ionic side chain, or 1-2 unpaired buried H bond donors and acceptors in the protein may be enough to "unravel" the native structure, leading to the denatured state. A more complete description of the energetics underlying protein structure and stability would involve quantum mechanical effects. These have not been studied in detail since quantum mechnanical calculations are difficult to perform on large molecules. Recent work has led an understanding of a new source of stability of proteins based on overlap of proximal molecular orbitals that stabilizes a protein through electron delocalization. Two common examples of electron delocalization that increase stability are resonance and hyperconjugation. Resonance involves delocalization of electrons through overlap of adjacent atomic p orbitals to form low energy molecular bonding orbitals. You may remember hyperconjugation being used to explain the relative stability of tertiary carbocations compared to secondary or primary ones. The typical explanation involves electron donation and pushing from the adjacent methyl groups which effectively decreases the charge on the carbocation. A more correct explanation involves overlap of molecular orbitals, specifically of a C-H s orbital from one of the C-H bonds of the methyl group with the partially filled p orbital on the carbon atom containing the charge as seen in the figure below. It should also not be surprising that orbital overlap accounts for hydrogen bonds interactions (in contrast to the more simplistic explanation of the attractions between the partial charges on hydrogen bond donors and acceptors). Bartlett et al (2010) have recently described two types of orbital overlaps involving electron delocalization that stabilize protein structures. Molecular orbital description show that two lone pairs on the oxygen (hydrogen bond donor) in amide bonds are different. One pair, ns (Figure a below) is in a nonbonding orbital with 60% s character, while the other, np (figure b below), has approximately 100% p character. Figure c below shows that a hydrogen bond between the carbonyl oxygen of the ith amino acid and the amide H of the ith+4 amino acid can be described in quantum mechanical terms as the overlap (i.e. delocalization) of the ns nonbonding orbital on oxygen and the s* antibonding N-H orbital. What about the np electrons on the carbonyl O? They found evidence for a new kind of stabilizing influence in proteins as the np orbital overlaps with the an antibonding p* orbital on the ith+1 carbonyl group (figure d below) when the two amino acids are proximal as parts of secondary structures, including alpha and 310 helices as well as in twisted b sheets. To test which phi-psi angles would allow close enough approach for np to p* interactions, the investigators performed quantum mechanical computations on possible conformations of AcAla4NHMe for which np to p* were possible (see figure A below). These calculations showed these interaction were possible for values of d ≤ 3.2 � and 99� ≤ θ ≤ 119� (figure a below). Distances less than 3.2 angstroms, van der Waals surfaces of the C and O on adjacent carbonyls overlap, suggesting that the interaction is quantum mechanical and not classically mediated. Next they calculated d and q values for on high resolution x-ray structures of known proteins. Red shading in the Ramachandran plot in figure c below phi/psi regions in actual proteins that meet the required geometry for np to p* overlap. Hence these geometry are abundant in proteins, especially in secondary structures described above. Figure: Ramachandran plots of n to pi* interactions. the number of H-bonds and secondary structure elements do not correlate with temperature, but the number of salt bridges do. in hyperthermophiiles (>80oC for optimal growth organisms) that thrive at very high temperatures (100oC), few internal cavities were found. in those that thrive at intermediate high temperatures (45-80oC) the surface had more polar residues. 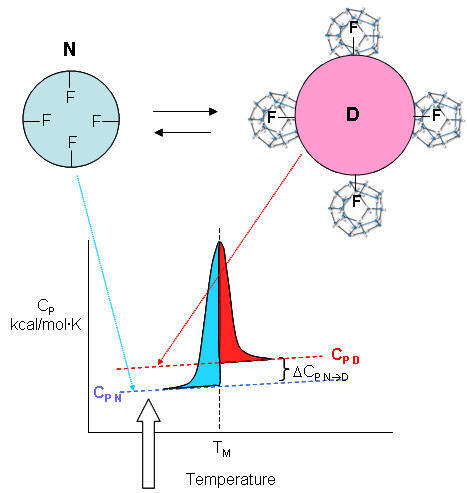 generally there was an increase in weaker ion pairs (increased distance between the charged side chains) in the hot group, but increases in strong and weak ion-ion bonds in the very hot group. Kashefi and Lovley recently reported the identification of a bacteria obtained from a hydrothermal vent in the northeastern Pacific ocean. In a laboratory setting, the strain grew in water at a temperature of 121oC under high pressure. These are the same conditions used in autoclaves to produce sterile samples. Cell doubling took place under these conditions in 24 hours. The authors suggest that this strain would be useful to determine molecules and their properties necessary for such high temperature growth. Using a computational program called Rossetta Design (PNAS, 97, 10383 (2003)), Korkegian et al determined mutations in buried side chains of the homodimer cytosine deaminase. Buried residues are presumably are important in the stability of a protein and are targets for mutagenesis experiments that would increase the melting temperature (Tm) of the protein. In the program, a target sequence was "threaded" onto the sequence of the template protein (the wild type protein) and changes made to side chains in the random sequence. Energies were calculated and those changes resulting in lower energies were saved. Target residues (88) within 4 angstroms of the active site and the dimer interface were fixed to those in the wild-type template in order to minimize alterations in the catalytic activity of the enzyme, cytosine deaminase, that they chose to study. Remember, the goal of the study was not to increase the catalytic activity of the enzyme, but rather increase its themostability. The rest (65) were changed and energies calculated. 49% of the amino acids subjected to random change produced no change in amino acid compared to the template (wild-type) side chain. 16 changes on the surface were ignored. Two sets of changes were observed, one involving amino acids packed between an alpha helix and beta strands, and the other set between two alpha-helices. These later mutants, when prepared in the lab using recombinant DNA technology, were soluble at high protein concentrations, and could be studied. Three different mutants (A23L, I140L, V108I) were made which increased the TM by about 2 degrees. However, a triple mutation had TM values 10 degrees higher than the wild-type protein and a 30-fold longer T1/2 at 50 degrees C. When the triple mutant was introduced into bacteria, the bacteria grew better at higher temperatures. Crystal structures of both the wild-type and triple mutants shown essentially an identical fold, with about 70 A2 of additional surface area buried in the mutant protein. Beeby et al. analyzed sequence and structural data from P. aerophilum (archea) and Thermus thermpilus (thermophilic bacteria) and found that disulfide bonds stabilized proteins from these species. Cytoplasmic protein from eukaryotes don't have disulfides due to the presence of reducing agents (such as glutathione) in the cell. In those thermophiles with disulfides in proteins, a novel protein, protein disulfide oxidoreductase, was found, which catalyzes the formation of sulfide bonds. Finally, Berezovsky and Shakhnovich have also analyzed proteins from hyperthermophilic archea and bacteria and compared them to analogous proteins from mesophilic bacteria. They found two types of stabilizations of hyperthermophilic proteins, depending on the evolutionary history of the organism. Proteins from cells that originally evolved in high temperature conditions (archea) were very compact (maximizing van der Waals interactions, had a high number of contacts per residue, and a high percentage of hydrophobic residues), but did not use specific structural stabilizing interactions (like electrostatic in salt bridges). In contrast, proteins from cells the originally evolved under mesophilic conditions, but later adapted to hyperthermophilic conditions had proteins that evolved specific sequences features that stabilized electrostatic interactions (more charged residues, salt bridges, . Bartlett, G. et al. n to pi* interactions in protein. Nature Chemical Biology. 6, pg 615 (2010). Kashefi, K. and Lovley, D. Extending the Upper Temperature Limit for Life. Science. 301, pg 934 (2003).